Those Blooming Gardens, I say! No, it isn’t a bad thing. It is a beautiful thing; something to be celebrated and visited! Which gardens would be the best places to experience the Berkshires in Bloom? I would say the Berkshire Botanical Garden, Naumkeag, the Mount and Chesterwood for starts. Each one for its own reason. The Berkshire Botanical Gardens is the largest public garden in the Berkshires. They have an amazing array of plants and displays to please any lover of flowers. Established in 1934 as the “Berkshire Garden Center” and revered as one of the older public display gardens in the Northeast, Berkshire Botanical Garden is a not-for-profit, membership-supported educational organization encompassing more than 15 acres of land in Stockbridge. The Garden is open year-round for classes, lectures, workshops and exhibits, and the display gardens can be toured daily from May 1 through Columbus Day. A showcase of horticulture and garden design and a “museum of living things,” Berkshire Botanical Garden features dozens of display areas that are educational, functional, and highly ornamental, with plant collections emphasizing plants that are native to the Northeast or that thrive in Zone 5b. Among the oldest in the region, the gardens have evolved and expanded over the years in breadth and variety. Naumkeag in Stockbridge, is a quintessential country estate of the Gilded Age, a 44-room Berkshire “cottage.” The stunning home was designed by the architectural firm of McKim, Mead, & White and served as a summer retreat for three generations of Choates. Joseph Choate was a leading 19th century attorney from New York. inventive spirit of Miss Choate and Fletcher Steele. 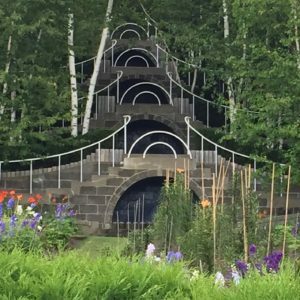 In a PBS special on the wonders of the world, Audrey Hepburn waxed poetic about the Naumkeag gardens, especially the striking Blue Steps, a graceful cascade of staircases, white railings, pools and paper birch trees. Edith Wharton’s home, The Mount, in Lenox is another spectacular Berkshire “cottage.” Here you may tour the stable, walk through the property and experience the sculpture on your way to the mansion. The Mount is one of only five percent of National Historic Landmarks dedicated to women. It is an autobiographical house, one that embodies the spirit of its creator. The classically inspired Main House, elegant Georgian Revival Stable, formal gardens and sculpted landscape represent the only full expression of Wharton’s influential architectural and landscape theories. make sure to visit the two main gardens there: the formal garden and the Italian Garden garden, a favorite spot for weddings. Wharton envisioned her gardens as an elegant series of outdoor rooms, in harmony with the house and the surrounding natural landscape. 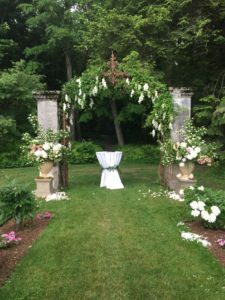 The sunken Italian Garden uses serene tones of greens and whites which, combined with porticos and alcoves in the stone walls, creates a cool, shady respite from summer sun. The centerpiece of this garden is a rustic rock-pile fountain surrounded by white begonias. A gravel promenade of linden trees connects the Italian Garden to the more formal French Flower Garden. The French Flower Garden’s rectangular pool is surrounded by beds of annuals, perennials and shrubs creating vivid but orderly burst of colors. Wharton loved phlox, stocks, lilies, hydrangea, dianthus, delphinium, and dahlias, all of which still grace the flower beds. Then there is Chesterwood, the summer home, studio and gardens of sculptor Daniel Chester French, most famous for his sculptures of the Minute Man and the Lincoln Memorial. Many of French’s plaster sketches, including models of Abraham Lincoln, are on view at Chesterwood. While French was initially attracted by the beauty of the Berkshires in Western Massachusetts, the view of Monument Mountain, in particular, became a primary focus for the location of his Studio and Residence as well as the landscape at Chesterwood. Also a talented landscape designer, French transformed the agrarian landscape, to suit his professional, social and utilitarian purposes, creating formal English gardens and woodland walks throughout the property. These are four of many wonderful historic homes and gardens in which to experience the Berkshires in Bloom. Call us at 413.637.9750 to make your reservation today! Isn’t it time to enjoy the flowers?